The bookstore in the basement of the Marvin Center no longer sells textbooks in the store, but there are a variety of other affordable options to consider. Updated: August 28, 2017 at 10:02 a.m. The only thing worse than sitting in a hot lecture hall while it still feels like summer outside is wheeling and dealing to get the best textbook deals. It might be especially hard to scramble to get them for a last minute assignment now that the GW bookstore moved to online-only. Luckily, we’ve got the best tips for getting your stacks ready for the upcoming semester. Once syllabi start flooding your inbox, you might be overwhelmed by the number and price of the books you need. But the books might be unnecessary. For some classes, if you attend every class and take thorough notes, you might not need to do the readings. Carefully look through the syllabus to see how much of the book you’ll need to read. If it’s only a chapter, then take a quick photo from a classmate’s book. If you’ll only need a book for a few assignments, sharing may be the best solution. You and a friend can share a textbook and complete assignments together, or switch off as you work on other coursework. Asking other students who have taken the same course with the same professor can also be a good way to figure out what you need and what you can leave on the shelf. Buying textbooks in advance can give you enough time to find the right book for the best price and get a head start on reading before all of your classes get busy. But if your schedule isn’t perfect yet and you intend to change it, save yourself from getting stuck with books for a class you might drop. Additionally, as students return to campus, they tend to find all the books they packed away after an exhausting spring semester. That could mean cheap, used books for you on sites like Chegg or Amazon. There are many frugal ways for you to buy textbooks, but the online campus bookstore isn’t one of them. Websites like Amazon, Chegg and Half.com provide textbooks at a fraction of the cover price. Online tools like StudentRate can then compare all of your online price options in real time. 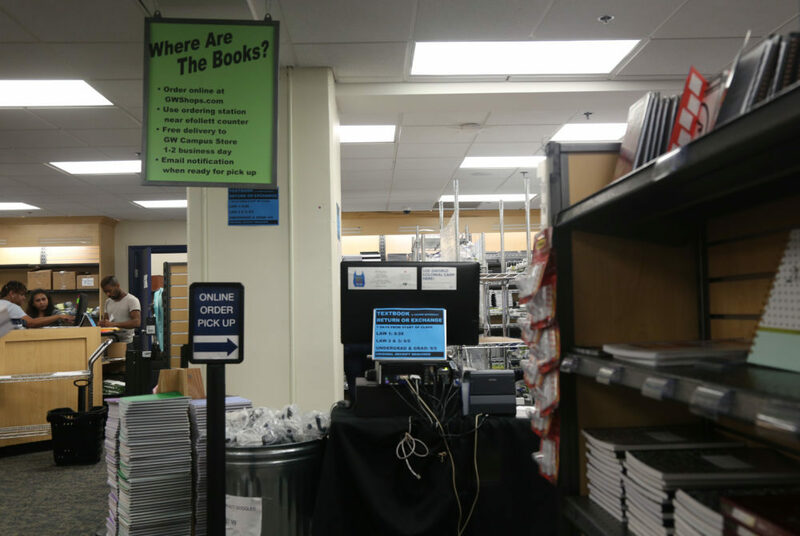 Running to the campus bookstore used to be a safety net for buying a book before an early semester assignment, but with GW’s bookstore transitioning to an online-only model this fall, it’s best to avoid it all together. Even if you aren’t studying international affairs, you may want to consider an overseas purchase when buying textbooks. Domestic-published textbooks are more expensive than the same textbook published and sold overseas, so buying an international edition is typically a cheaper option. You can purchase these textbooks on sites like AbeBooks and TextbookRush. The international edition won’t arrive with a glossy cover or the same IBSN number as its U.S. equivalent, but the contents and page numbers are generally the same and come at a fraction of the price. This year, it’ll be even easier to avoid buying books. GW Libraries announced a new program this month that will make books from more than 30 high-enrollment courses available for checkout throughout the school year in two-hour periods. This means you can run to the library, instead of the bookstore, to get that last-minute reading done in time.